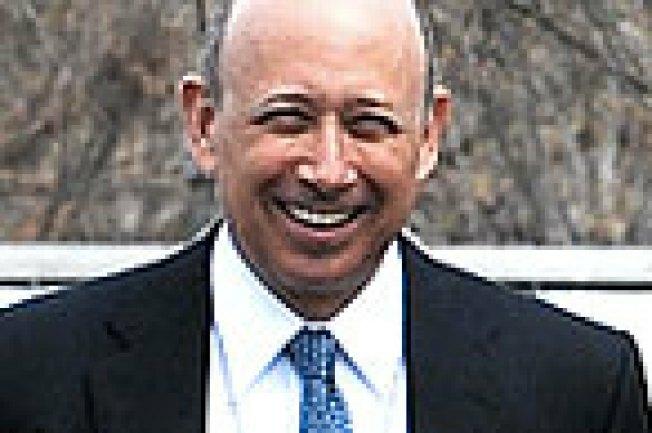 Goldman chief Lloyd Blankfein has a lot to cheer about. NEW YORK — Goldman Sachs, in another sign that banks may be turning around, beat Wall Street's earnings expectations as it reported a profit of $1.66 billion for the first three months of this year. The bank also said it planned to raise $5 billion in stock to help it pay back government bailout funds. The New York-based bank said it earned $3.39 per share, easily surpassing analysts' forecasts for profit of $1.64 per share. This compares with earnings of $1.47 billion, or $3.23 per share, in the quarter ended Feb. 29 of last year. Goldman's news, released a day earlier than anticipated, came days after another top-performing bank, Wells Fargo & Co., said it expected to report record first-quarter earnings of $3 billion, well above Wall Street's estimates. That news fed a huge stock market rally Thursday, but with companies including Citigroup Inc. and Bank of America Corp. still to report their first-quarter results, it was too soon to say the banking industry was finally recovering from the devastating losses caused by the credit crisis and the recession. Investors showed some caution after Goldman's announcement, which followed the close of regular trading on Wall Street. Goldman shares initially rose in response to its report but then slipped 1.5 percent. Citigroup, which surged 25 percent during regular trading, rose a more modest 1 percent in after-hours activity while Bank of America rose 0.7 percent after jumping 15 percent during regular trading. Morgan Stanley fell 3.3 percent in late trading after jumping 6 percent during regular hours. Goldman's total revenue was $11.88 billion during the quarter, compared with $18.63 billion in the prior-year quarter. Analysts forecast revenue of $7.19 billion. Goldman said profit was bolstered by strong revenue growth in its fixed income and currency businesses. The Treasury market and the dollar were beneficiaries of investor uncertainty during the first two months of the year; in March, the stock market began a five-week rally that lifted the major indexes off 12-year lows. Results improved significantly over the fourth quarter, when Goldman reported its first quarterly loss since becoming a public company in 1999. Hurt by the plunging value of its investments, especially at its principal trading desk, the firm lost $2.29 billion during that period. When Goldman became a bank holding company last fall amid the mushrooming credit crisis, it switched its reporting cycle so its fiscal quarters were in line with calendar quarters beginning Jan. 1. To adjust its reporting schedule, Goldman began fiscal 2009 on Jan. 1 instead of Dec. 1 of last year. The bank said for the month of December, which fell between the change in reporting cycles, it lost $1 billion, or $2.15 per share. Goldman's first-quarter performance put it in a strong enough position to plan the public stock offering of $5 billion which it said would be used, with additional resources, to pay back its government debt. Goldman received $10 billion in government funds during the downturn last fall as part of the U.S. Treasury Department's program to invest directly in hundreds of banks and try and help alleviate the nearly frozen credit markets. Goldman executives have said for months that the company wanted to repay bailout funds this year. Many banks have chafed under restrictions, including limits on executive compensation, imposed by the government as it dispensed the bailout money. The banks have also come under sharp criticism from lawmakers and the public for a variety of business practices. Its earnings improvement lends support to what bank CEOs have been saying in recent weeks: That business conditions have started to stabilize. Encouraging words from several big bank CEOs that they were having a better quarter than most expected have helped fuel hopes for an economic recovery — and led the stock market to its best four-week performance in more than 75 years. Many hinge the end of the recession on the health of the nation's banking system. Goldman also declared a dividend of 35 cents, down from 46.7 cents but still a healthier payout than many banks have been able to give shareholdeers.